Peace was not very common in the Middle Ages, especially in Europe. The Crusades against the Muslim Turks was fought for three centuries, and the Hundred Years' War in which England fought against France lasted from 1337 to 1453. Even when there were no major campaigns in which to fight, barons and brigands raided their neighbors. 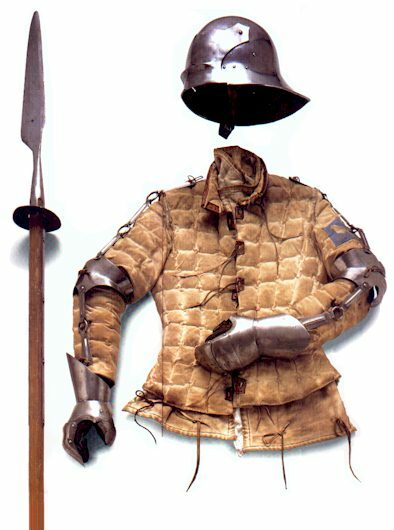 In the early Middle Ages, the fully armored knight ruled much of the battlefield. He scorned the foot soldiers, who were usually just peasants, forced to fight by their lords. But by the 15th Century the knight was fast becoming obsolete and ordinary soldiers were becoming more important. Lords started employing professional warriors who were skilled and used to obeying orders . They were well paid and many became mercenary soldiers, hiring themselves out to the person who offered the most. 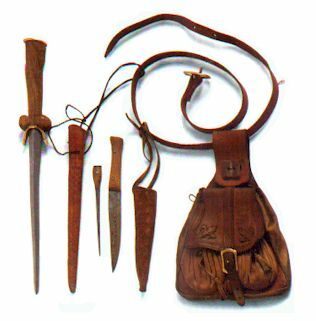 The weapon on the left is called a "glaive" and was used to stab or knock the enemy aside. The "jack" (shirt) is made out of multi-layered canvas. Notice the chain links on the shoulders which kept swords from slicing through the arm. The helmet is called a "sallet." The visor limited vision, so it was lowered only during fierce fighting.